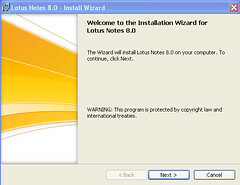 This is a simple tutorial on how to install Lotus Notes 8. 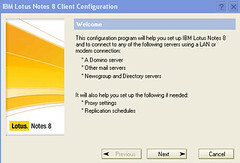 Download the Lotus notes client from ibm.com website (C13NBEN.exe), than run the file. If you already got the CD than you can run the installer directly from the CD. 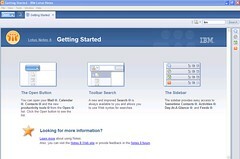 In IBM website there are two version of Lotus Notes 8, the basic version and the standard version. To learn more about differences between basic and standard, you can read it here. Type the user name and the organisation. 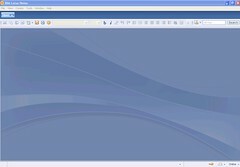 The default installation will be in c drive, you can change it to any drive or folder you want. 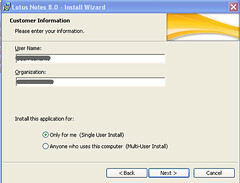 But, if you select Multi User install, all Lotus Notes data files will be saved in each user My document folder. If you using Multi user install, you can only change the program files not the data files. 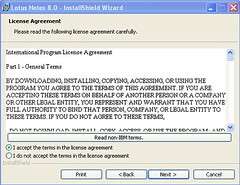 Note that the default installation will not include Composite application Editor. Now Installation is finish, and let the fun begin. An impressive flash screen. Note the Build On Eclipse remark. 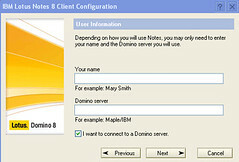 If you want connect to the Lotu Domino server, the user name must be created first. 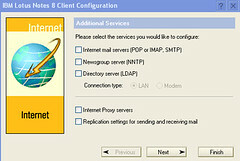 Select additional services that you want to configure. A Clean Workspace, most people will love it. A new Welcome Page, simple. A whole new preferences, much more complex too. 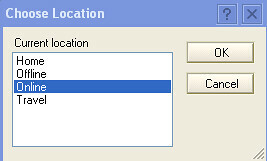 In edit location, in servers tab, there is no more sametime server entry. 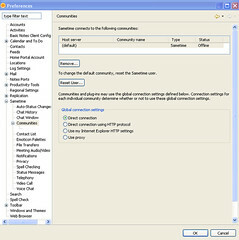 To change the sametime server, you should go to preferences, and go to Sametime then select Communities. The SameTime is works now. 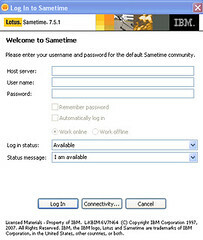 In Host Server, use the fqn of the SameTime server. 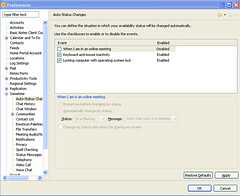 After I changed that, my SameTime server works, and it a very good client. 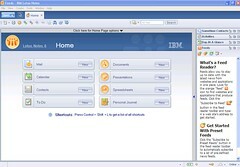 The way that SameTime Client placed in the sidebar is very nice. 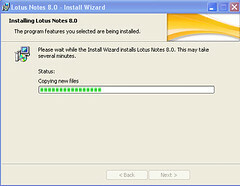 The new Getting Started, from here you can learn about all you features in Lotus Notes 8. 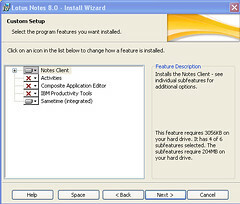 Lotus Notes 8 have many features, more more features than lotus notes 7. 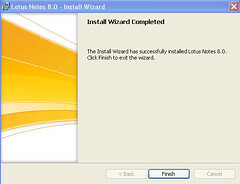 It will be fun to learn all the new features in Lotus Notes 8.
this is my first time installation of Lotus Domino… thanks for this guide. more power to the source. Olá, como faço para setar meu nome completo no envio de email, ou seja, quem receber verá João Alberto Rodrigues e não somente o meu email jalbertor@uol.com.br. Estou com o Notes 8. Are you an administrator? or you only want to change for your self? 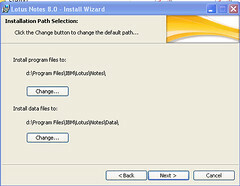 how to make different versions of Lotus domino and Lotus Notes compatible with each other..??? @waqas, it’s recommended that you upgrade the server first, then the clients because domino usually backward compatible. 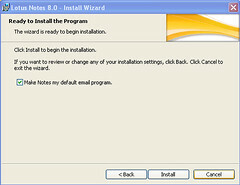 Or you can try to use lotus notes 8.5.3. client, but still using the mail template from 6.5.